Ever wondered if you’re missing out on Google’s search advertising features? It can be really discouraging to put so much effort into your branding and website and not receive the amount of traffic that you had hoped for all because your website it not being seen by the right people. Well, Google AdWords is here to help! So…Google AdWords. What is it and How Exactly Does it Work? Google Adwords is a fantastic tool that businesses and advertisers can utilize in order to grow their online sales, brick-and-mortar sales or simply just draw more attention to their brand, product, service or website. There are many different features and settings that allow for campaigns to become pretty complex. However, in a nutshell, Google AdWords is an advertising service through which you can display ads on Google’s search engine and its various partnered advertising networks. The great thing about this service is that in certain settings, Google will only charge you whenever someone actually clicks on your ad. This kind of advertising is known as Paid Search or Search Engine Marketing (SEM). This is achieved by pay-per-click bidding on targeted keywords. Keywords can be single words or a group of words forming phrases that people are searching for in relation to your product or service. The first step when approaching a paid search engine marketing campaign is to define your business goals. Maybe you are looking to encourage people to take actions on your site, download your app, call your business, or make a visit to your physical store. Whatever you are looking to achieve, it is important to clearly define the goals of your Adwords campaign. Once your business goals have been specified, you can move on to deciding which sort of advertisement you are interested in running. There are several ad formats as well as placement options from which you can choose. Now let’s explore these options in a bit more detail. The most common advertising method is text-based ads on the search network, also known as Search Advertising. 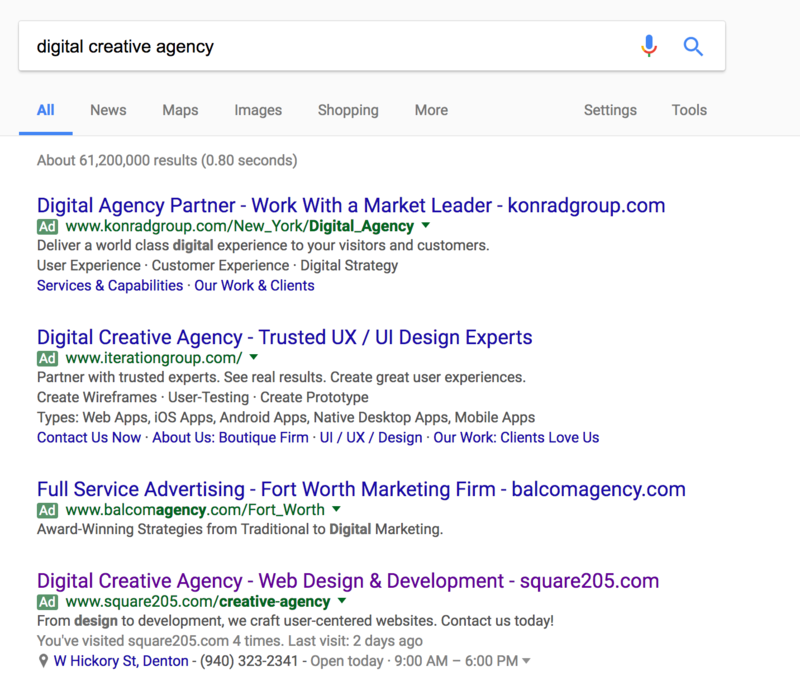 These are the advertisements that show up at the top (and sometimes bottom) of Google’s search engine result page (SERP) once you have conducted a simple Google search. These ads generally consist of brief copy about your business or webpage and some sort of call to action (CTA). A call to action in these kinds of ads can be very simple, short and to-the-point. Some good examples of CTA in search advertising would be things like “Call Us Today!” or “Click To Download Our The App.” The CTA is vitally important in these ads because it encourages the user to take the next step to becoming a future customer. There is more to Adwords than just simple text ads. Additionally, advertisers can create effective visual campaigns using Google’s Display Network. The Display Network consists of a collection of partnered sites. Through the Display Network, you can deliver digital graphics or video ads. These kinds of ads are a great way to gain more exposure to your brand. It is almost as if you are paying for a billboard, just on a website. The settings can be carefully adjusted so that you are either charged whenever someone clicks on the ad or just when someone actually sees the ad. Here’s a quick video to give you a little more insight into the beauty of the Google Display Network. Another ad format that people are pretty familiar with is video advertising. You may have noticed the last time you were watching a YouTube video an ad played before or maybe during your selected video. Yep, you guessed it, those ads were brought to you by Google! Ads on Youtube can be played at the beginning, middle, and end of videos or be displayed in the search results at the top of the page. Some basic targeting options can be applied as well such as age, gender, and location. These ads can be a great way to gain exposure to your brand. This feature may also be combined with remarketing ads. Remarketing ads are ads that will show to people who have previously visited your site. One way to evaluate if this kind of advertising is right for you is to consider your targeted audience’s demographics. If research shows that your targeted audience does not watch very many YouTube videos, then it would not be a smart idea to pay to have your ads be displayed there. However, if research shows that the audience that you are looking to target watches a lot of YouTube videos, this might be a great option. Luckily YouTube and Google Analytics does a pretty great job in providing marketers and advertisers with information on who is seeing and clicking your ads so the success of the ads is easily measurable. At Square 205, we offer media production services along with our marketing services. We have experience in production of television commercials, motion graphics and more! Feel free to reach out to us for more information, we would love to talk with you about developing video ads for your business. Check out some of our previous video work! You also have the capability to advertise to people who might be away from their desktop computers. Adwords allows you to display ads to people right on their mobile devices which can even be paired with location targeting. 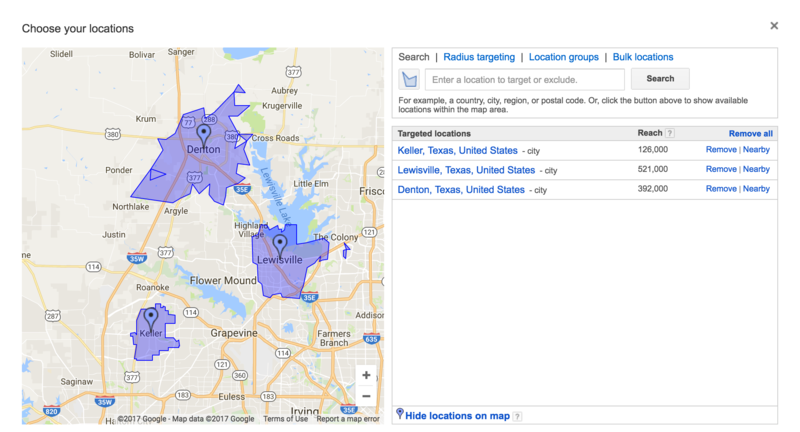 With location targeting, advertisers can narrow down the geographic location in which their ads will show. 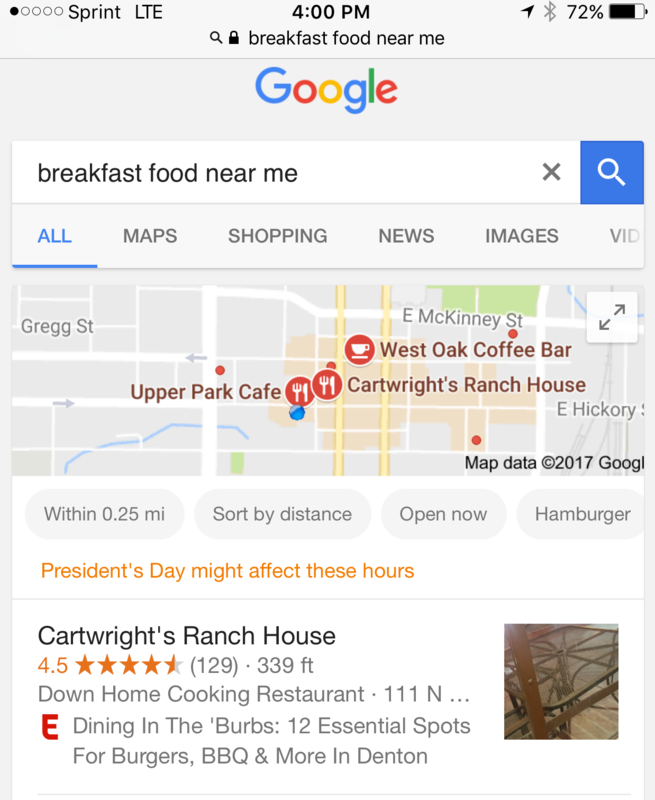 Let’s say you own a local restaurant and would like to target people who are searching for “breakfast food near me”. Through AdWords, advertisers can adjust the settings to only show ads to people who are on their cell phone and are within a certain distance of your restaurant. This function has the potential to save you money because you’re only targeting to people who are likely to come into your business. Mobile-targeted ads have shown to be highly effective. Research has shown that about 70% of people searching on a mobile device will call the business directly from an ad. Last but not least, we have the Google Shopping Network. With the Shopping Network advertisers can expand your product offering beyond your eCommerce store by incorporating an image and price point of your product in the search results. However, the Shopping Network is a bit different in that it doesn’t use keywords in determining if your product will show near the top of the results. Google uses its own set of data to determine if your product is relevant to the searches of potential buyers. This, however, does not mean that keywords are not important in determining your rank in the results. 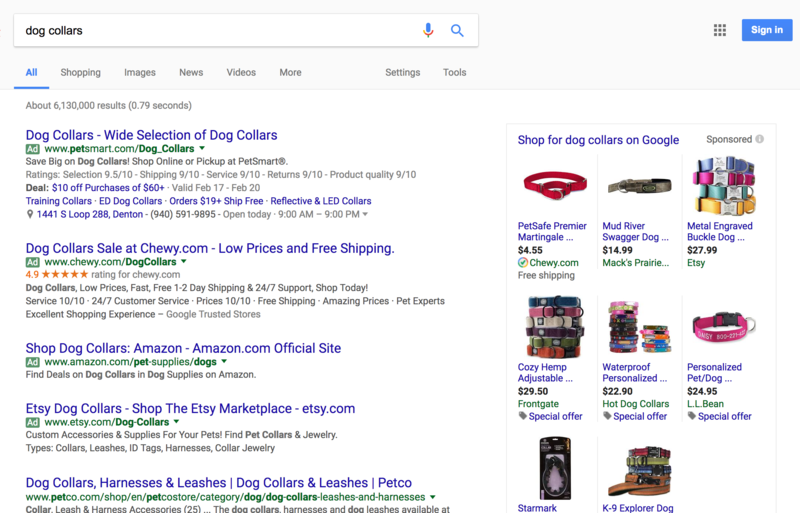 For many sellers, the Google Shopping Network can be very beneficial at reaching new customers that might not have seen or known about your product before. You might be thinking… this all sounds great, but where do I start? It’s all a lot to consider and as you can tell there are many different tools and features that advertisers can use with Adwords to help your business flourish. So which of these marketing options is the best fit for your business needs? We would love to talk with you more about your business goals and how we can help you grow your business through the use of Google AdWords.